In my various roles during the BORP Goalball Invitational, I am generally too busy to reflect on the events and tenor of the day while it is happening. And year XXIII was no different as we crammed 12 exciting games into an 8-hour period. However, in immediate contemplation post-competition (and with the help of a cold beer(s)), I was most struck by the camaraderie among the athletes and teams and the support the veteran players provide to the less experienced. So, while this event is very much a competition, for me it also embodies the sports experience at its best for the athletes, spectators, and volunteers! It wouldn’t be possible without all of you! GAME 1: Honey Badgers versus Seriously! Seriously! was not able to field a full squad for this game and played with only 2 players: Bryanna Stubbert and Brandon Young. The Seriously! 2 put up a valiant fight but Honey Badgers were able to find the gaps and hold off Seriously!’s late surge and won 7-4. Chris Lucero had 4 goals for the Honey Badgers and Brandon Young had 4 on the losing side. The Badgers other 3 goals came from Michelle Yoo. GAME 2: Replicas versus Walking Dead. Two powerhouse teams took the court and both came out firing bombs! Replicas took an early 3-0 lead behind Joe Hamilton’s 3 goals but that lead was gone in a jiffy as Grej Pesjaka scored 5 unanswered goals in a minute and a half to put the Dead up 5-3 at halftime. In the 2nd half the Hamilton/Pesjaka duel continued but the Replicas slowly crept ahead as Replicas’ Roger Acuna found the net for 2 critical goals. 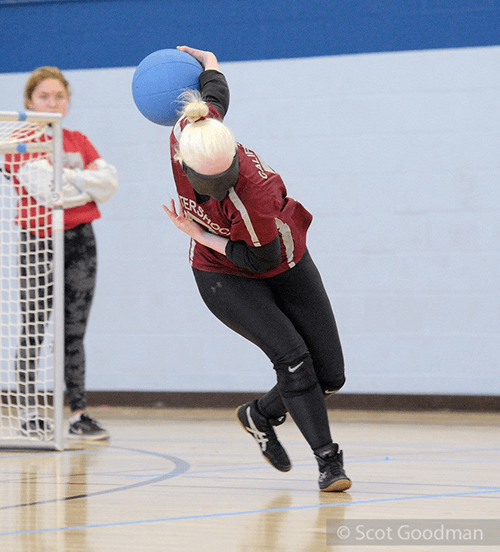 The Replicas again fashioned a lead late in the 2nd half and their defense steadied just enough in the final 3 minutes to capture a 10-8 victory. Joe Hamilton had 8 goals for Replicas and Grej Pesjaka had 8 for the Walking Dead. GAME 3: Seriously! versus Cal Bears. Early nerves put Cal in a 4-1 halftime hole as the defense was slow to get into gear. Seriously!’s goals in the 1st half came from Mandy Gargano (3) and Brandon Young (1). The second half was more of the same as Young (2) and Gargano (1) led Seriously! to a 7-2 triumph over the Bears. Sergio Lopez and Tiffany Zhao each had a goal for Cal. GAME 4: Honey Badgers versus Replicas. An early goal by Replicas’ Christella Garcia was the only score in the 1st half as both teams played superlative defense. In the 2nd half the Replicas built their lead to 3-0 with goals coming from Garcia and Casimir Werda. Starting at the 3:22 mark the Honey Badgers offense came alive and goals from Lucero (2), Jeshua Aveno (1) and Yoo (1) put the Badgers ahead 4-3 with 14 seconds left. This only left time for one more throw from the Replicas’s and Garcia made it count with a goal and a 4-4 tie. GAME 5: Cal Bears versus Walking Dead. A re-grouped Bears team shed their first game jitters and took a 3-0 lead in the 1st half with goals from Lopez (2) and Jessica Adams (1). Walking Dead’s Pesjaka led a 2nd half surge with 5 goals but the Bears kept up their scoring as Lopez tallied 3 and Adams 1 to earn a 7-5 win. GAME 6: Seriously! versus Replicas. Replicas blistered the nets throughout the 1st half and took a 6-3 lead with goals from Hamilton (3), Acuna (2) and Garcia (1). Both teams came out with a defensive mindset in the 2nd half and shot after shot was blocked with each team getting only one more goal and Replicas eventually taking the 7-4 win. Replicas final goal tallies were: Hamilton 3, Acuna 3 and Garcia 1 while Seriously! had 2 from Khemnesuel Fisher, 1 from Bryanna Stubbert and 1 from Young. GAME 7: Walking Dead versus Honey Badgers. Walking Dead got an early goal and never took their foot off the gas pedal against the Honey Badgers. Badgers got 2 late goals in the 2nd half but no answer for the Dead onslaught and lost 9-2. Dead goals came from Pesjaka (5), Victor Hakopian (2), Jon Marcotte (1) and Elena Hodges (1). 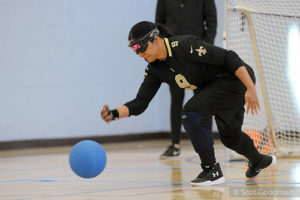 Honey Badgers’ Aveno and Lucero had 1 goal each. GAME 8: Replicas versus CAL Bears. Team defense was the story of this game with Replicas Building a 3-1 lead behind goals from Acuna (2) and Micah Aveno (1). In the 2nd half Cal scored an early goal to pull within 1 but could not break through and lost the nail-biter 3-2. Sergio Lopez scored both Cal goals. GAME 9: Walking Dead versus Seriously!. Young and Fisher led the offense for Seriously! while Pesjaka was in top form for Walking Dead. When the dust had settled Dead had an 8-6 win with all 8 goals coming from Pesjaka. Fisher (4) and Young (2) had the Seriously! goals. 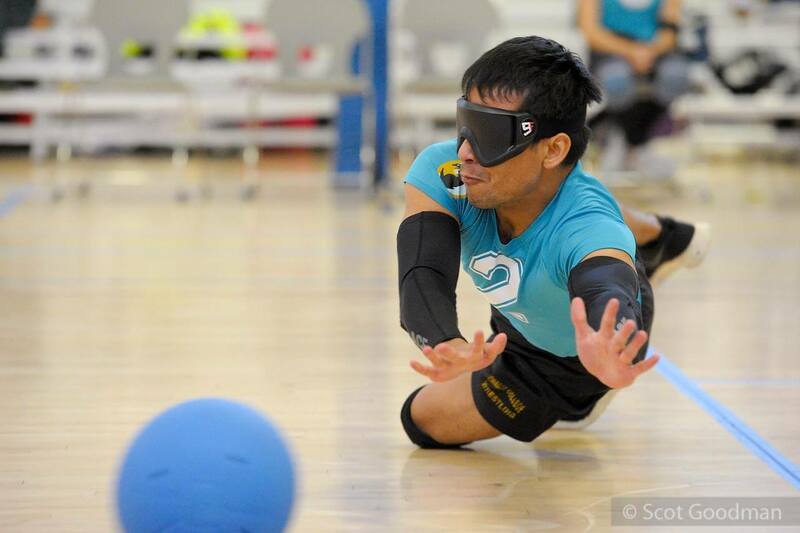 Jeshua Aveno dives to block the ball. GAME 10: Cal Bears versus Honey Badgers. Brilliant defense characterized the first half of this match. At halftime, the score was 1-1 with Lopez scoring the Bears goal and Aveno the Badgers lone tally. The 2nd half was similar through the first 2 minutes but then the Bears went on a goal-a-minute spree, with 2 goals each from Lopez and Adams, and rolled to a 5-1 triumph. 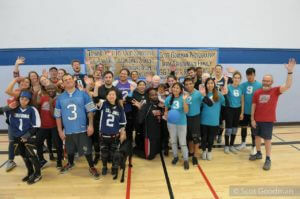 With Pool Play complete the matchups for the playoffs were set with Walking Dead facing Honey Badgers in the 3rd Place game and Replicas and Cal Bears in the title match. GAME 11: 3rd Place: Walking Dead versus Honey Badgers. In pool play Walking Dead had made quick work of Honey Badgers but the 3rd Place game was a different story. Both teams were in good defensive form and half #1 ended in a 2-2 tie. Dead’s 2 goals came from Hakopian while Badgers got 1 apiece from Aveno and Lucero. In the 2nd half the Badgers crept ahead 4-2 with goals from Aveno and Lucero, but that lead evaporated quickly as the Dead’s Pesjaka blasted 3 quick goals through the Badgers defense. The Badgers got a tying goal (5-5) from Yoo with 1:35 left but Pesjaka found the net one more time with 40 second left and secured the 6-5 3rd Place victory for the Walking Dead. GAME 12: 1st Place: Cal Bears versus Replicas. The Bears who started the day with a shaky defense, re-found their mojo to get in the title game while the Replicas used their all-around game play throughout the day to earn their spot. Cal owned the first half and the first 6 minutes of the 2nd half and had a 4-0 lead with 1 minute left behind 4 goals from Lopez. Quick back-to-back goals from the Replicas’ Hamilton put the result in doubt with 32 looong seconds left. 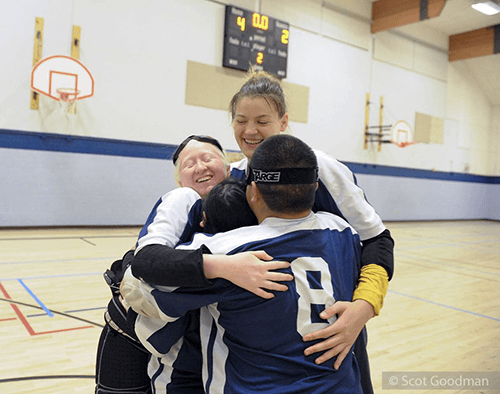 However, with the game on the line, Cal tightened up their defense and won the title of BORP Goalball Invitational XXIII, 4-2. Go Bears! 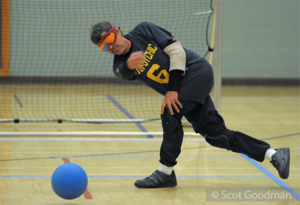 Bill Johnson, BORP goalball volunteer, for almost 3 decades is moving to Grant’s Pass Oregon. BORP Goalball commissioned a tribute book for Bill from Scot Goodman including photos from his career at BORP and the following text. Brother versus sister: Jeshua Aveno scored 5 goals for Honey Badgers and finished in 4th Place while Micah Aveno had 1 goal for Replicas but finished in 2nd Place. As with every tournament, there are numerous people and businesses that contribute to the success. 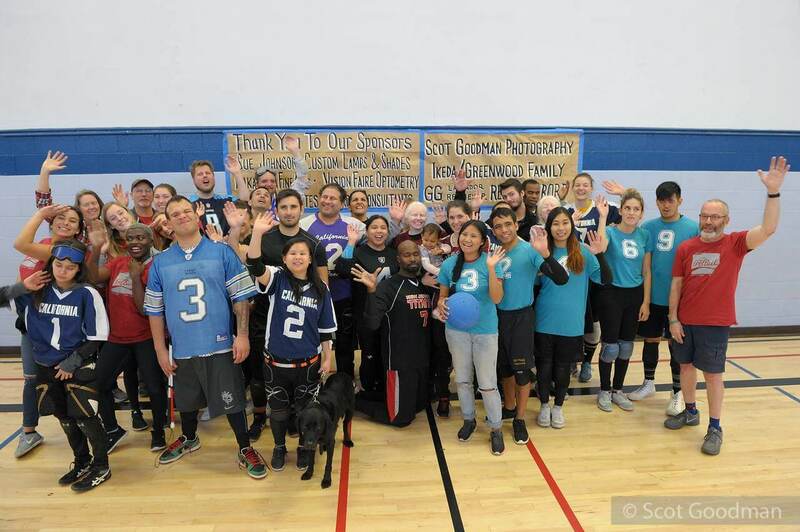 And a note of appreciation for event support to James Kenney Community Center staff, Kim’s Sandwiches, Alliance Graphics, UC Berkeley Goalball.